Project Goal(s): Senior fashion students will weave a textile in order to construct a simple garment for the Spring Fashion Show and to understand the evolution of weaving textiles for garments in history. Through a 6 week residency with Textile Arts Center, the students analyzed different fibers, studied the process of how a textile is produced, created a concept and design, and finally produced a textile through tapestry weaving and on a backstrap loom in the classroom. They also had the opportunity to visit the 3200 sq ft Textile Arts Center in Brooklyn with state of the art equipment and resource library. Two visiting professionals, a print textile artist and a weaving artist for NYC, came to speak to the students. "Students worked with the Textile Arts Center to create and design an original woven textile and resistant dyed knit. 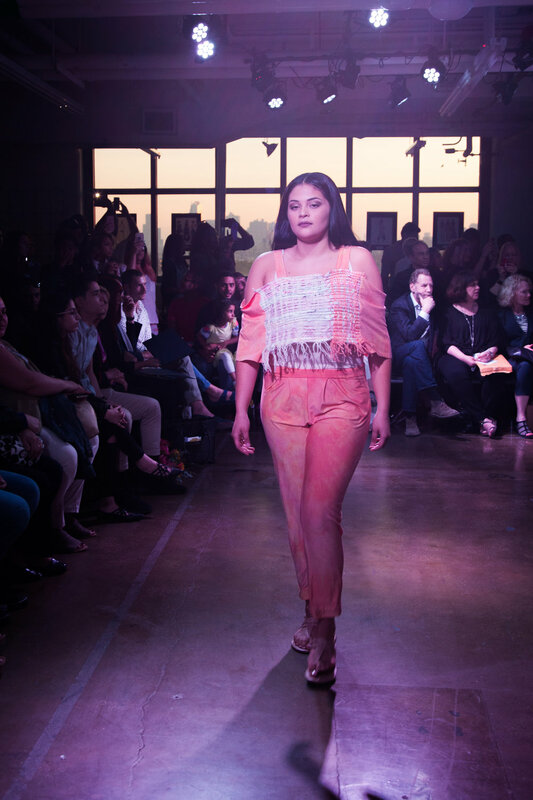 The students constructed a loom, created designs from concept to final garment and then showcased these garments on the runway with a live model. This process took perseverance, innovation and commitment. The outcome for the design students was that the showcase built confidence and provided them with a professional skill set that they will take to college or career."